Biryani is a a rice based dish with spices and vegetables/meat. The masala used in making this is called Biryani Pulav Masala. 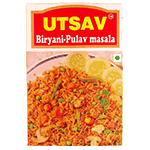 UTSAV Foods has created this aroma that makes your Pulav and Biryani extraordinary. This is an assortment blend that includes ground, leaf and whole spices. Rice preparations were never so delightful. This product has an aroma of it's own which makes it so special. Product of India.